Having a monthly subscription box keep you on track could really work long term. You've got recurring billing to track, packages arriving each month, and new ideas of how to keep things interesting with fun surprises in each of your boxes. PS. 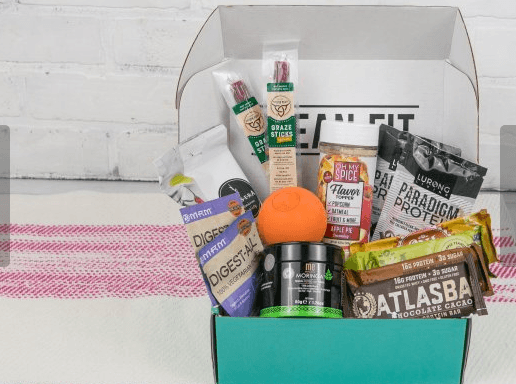 In this list, we’re showcasing some of the best weight loss subscription boxes out there. I'd also recommend check out our weight loss meal delivery services and weight loss meal kits. Both are food delivery programs aimed at help you eat healthy throughout the week. This popular subscription offers a small selection of supplements. 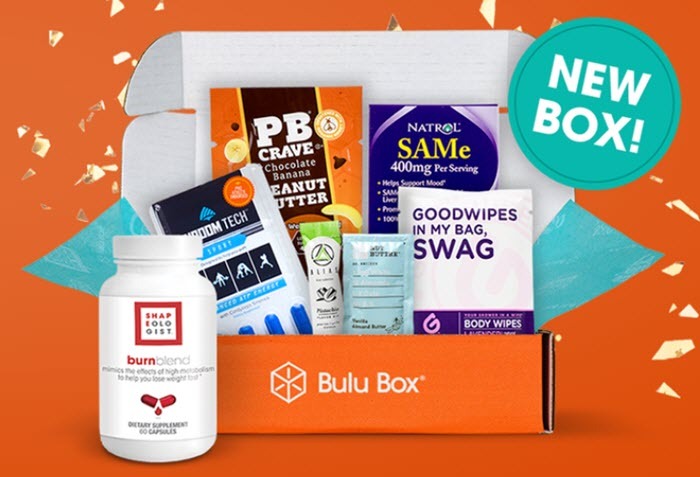 While most boxes on this list support weight loss in some way, Bulu Box is one of the few that directly focuses on the field. To do so, the subscription program doesn’t just provide you with snacks. The boxes also contains related items, including supplements, fat burners, meal replacement products and more. The exact combination of items depends on which of the 3 box types you choose. The first is the Original Bulu Box. It offers a combination of products in the fields of wellness, immunity and nutrition. The second is the Weight Loss Box. As the name suggests, this version aims to help you lose weight. This is the box that includes weight loss supplements. Both of those versions start out at $10 per month. You can decrease it to $9 or $8 a month by pre-paying. Each box contains 5 to 6 products. Unlike other companies, these are all just samples. The goal is to help you figure out which ones would be best for you to buy. The last box type is the Burn Blend Box. This is more expensive, costing $32.99 per month. The price difference is because the box also contains a full-sized bottle of Burn Blend, which is a weight loss supplement. This box provides a wide selection of fitness related snacks. Fit Snack was developed with the goal of helping people to be healthy and happy. To do this, the company provides various snacks, along with nutritional tips and fitness tools. The snacks are selected by a nutritionist. These tend to be low in sugar, high in protein, raw, vegan and/or natural. The boxes cost $27.90 if you’re ordering from one month to the next. Pre-paying for a longer-term plan decreases the price per month. This gets down to $24.90 per month for the 12-month version. A 12-month membership also comes with a bonus bamboo toothbrush and a water bottle. Unusually, Fit Snack doesn’t say how many items you’re getting in each box. They simply focus on the idea that the contents vary each month and that the boxes are always packed with snacks. This athlete-focused box is good for weight loss too. CoreGains is mostly a subscription for muscle development. 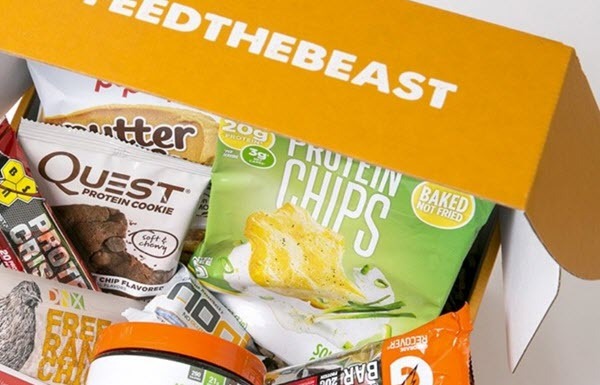 This is because the box features high protein snacks, along with those that promote energy. Those same items are also relevant for weight loss. After all, high protein snacks help reduce cravings for unhealthy food. The featured snacks are also very healthy, which includes being organic and suitable for vegans. The style is effective, especially as vegan protein snacks are often harder to find than non-vegan protein products. 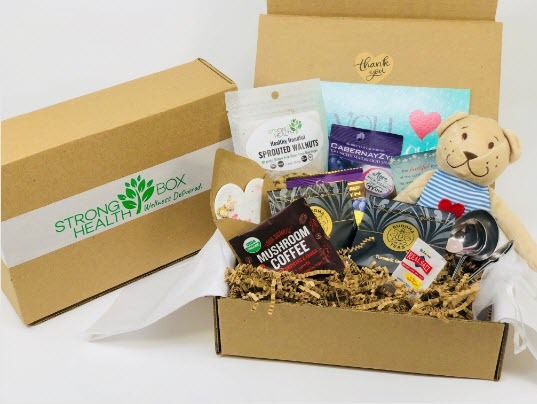 This healthy subscription box would help to keep you on track. HealthyMe Living was developed as a way to make healthy snacking easier. Many of the readily available snacks are highly processed and packed full of artificial ingredients. The snacks in the HealthyMe Living box are different. They don’t use trans fats, GMOs, artificial ingredients or high fructose corn syrup. They also include ingredients that can help promote nutritional benefits. The choice of snacks makes these boxes perfect for many situations, including weight loss in adults and children. 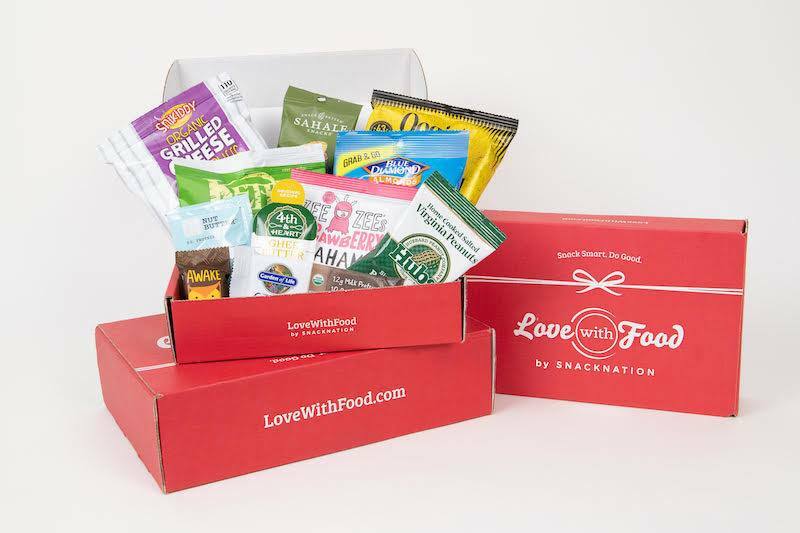 The subscription provides you with 7 to 10 snacks per box, starting at $29.99 per month. You save some money by paying for a longer term up front. One limitation is that many of the included snacks come from common brands. Some are even items that you’d find in your local store. As such, the subscription might not suit everyone. This weight loss box is ideal for any keto dieters. 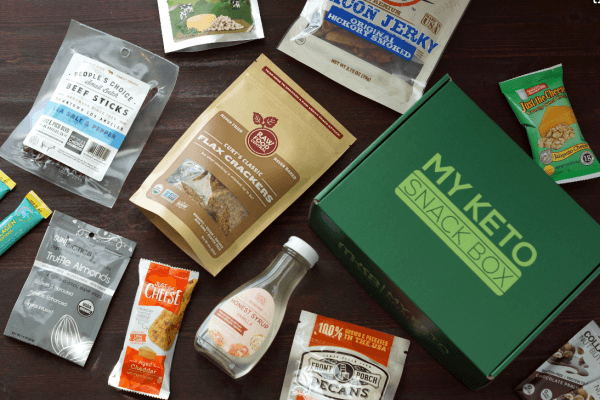 The keto diet is a popular weight loss approach and the My Keto Snack Box subscription is a perfect choice for anyone that is already following keto. The box could also help you get started, as keto snacks can be difficult to find. Even if you’re not interested in keto – the subscription is worth trying. The individual snacks are all low carb and healthy, so they should help with weight loss regardless of your diet type. My Keto Snack Box ships out once a month. Each box contains between 8 and 11 individual snacks (sometimes more). All of these have a net carb content of less than 5 grams per serving. This makes them perfect for keto. The information is also important – as many keto boxes don’t provide the carb details. Subscription is simple. You just pay $38 per month and cancel when you want to. You can also pre-pay for 3, 6 or 12 months. A 6-month pre-paid subscription will save you 2.5%, while a 12-month version saves you 5%. 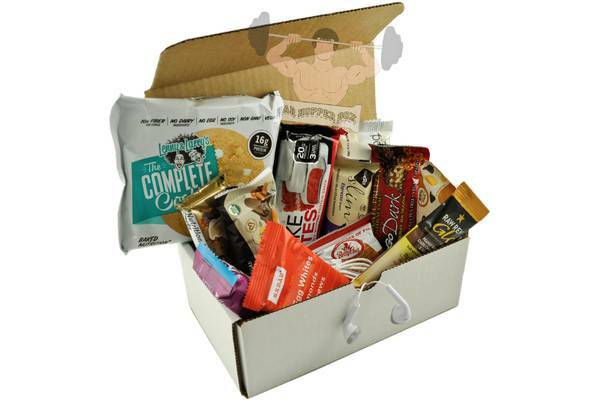 Here’s a simple box that offers a selection of protein bars each month. 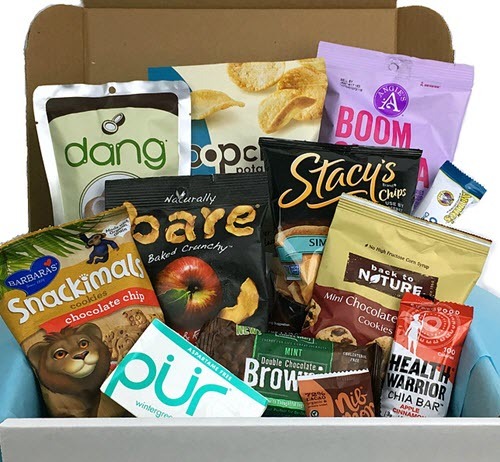 BarHopperBox focuses on protein snacks. This type of snack is useful for many situations, like helping to boost your energy while keeping you going until your next meal. The portability of such snacks makes them perfect for weight loss too. 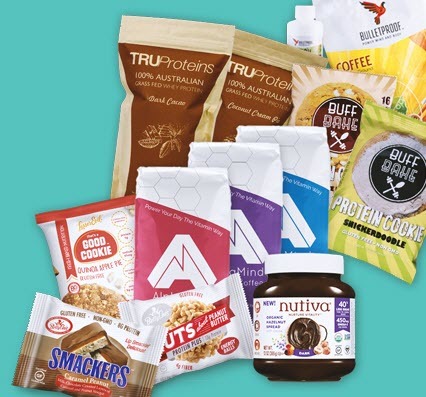 The monthly box provides you with 12 full-sized protein products. Most of these are protein bars, but you’ll often find protein cookies and related items as well. BarHopperBox focuses on items that are low in sugar and non-GMO, which adds to the advantages. They even throw in a pair of headphones. How cool is that? You’re paying $35.99 per month for this subscription. There are no pre-pay options, so you simply stay a member until you are ready to cancel. 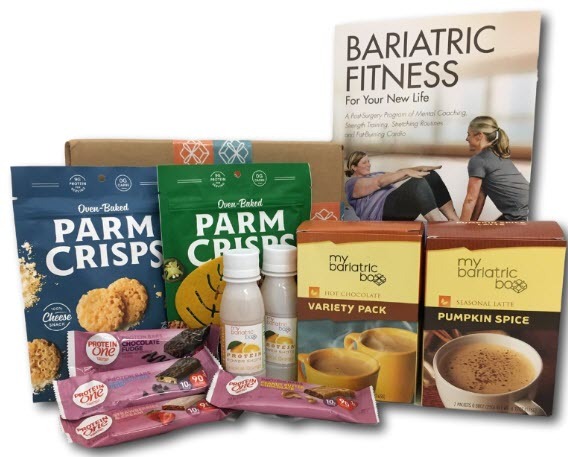 This new subscription box is an exciting weight loss choice. Half It is a new entry into the subscription box field. It is targeted at people who are passionate about fitness and is more than just a snack box. 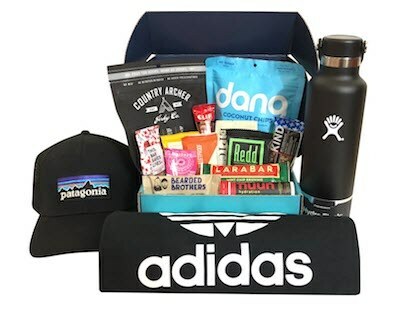 Instead, the subscription also provides high-quality branded items, such as Adidas shirt or a beanie from The North Face. The company states that their boxes will always rely on quality brands and that they’ll be ‘filled to the brim’. This means there will be no padding to make the box seem fuller than it is. The total item value will always come to at least $80 in value, while the box itself just costs $39.99 per month. There is one limitation – availability. The Half It site states that their debut box has already completely sold out. You can sign up to be placed on a waitlist, but there is no guarantee that there will be enough boxes for everyone on the list. Here’s a second box for anyone on the keto diet. With a name like The Keto Box, it’s easy to see that this option is designed for keto dieters. It is a particularly popular box, one that often features unusual or hard-to-find snacks. The subscription also comes with a 28-day meal plan to help you get started on a keto diet. The box contains 8 to 11 snacks (sometimes more), for a total price of $40 per month. Monthly coupons are also included. These allow you to get discounts on some of the keto products that you love. As is sometimes the case, this box sells out fast – so order while you can. This box focuses on healthy snacks and other related items. The Strong on Health Box stands out because it doesn’t just offer snacks. The box provides a selection of healthy items, including snacks, guides, organic teas and related products. This can even include lifestyle items and supplements. The end result is a greater focus on holistic health, rather than just the food that you eat. Subscribing to the box will cost you $29.95 on a month-to-month basis. You can also pre-pay for 3 months or for 6 months. Doing so provides you with a discount on the monthly total. There is also the ability to buy some of the old boxes individually from the site. This is a good way to try out what the service has to offer before signing up to a subscription. The clean focus of this box makes it ideal for health and weight loss. Modern snacks are often heavily processed – making options like the Clean.Fit box so valuable. The included snacks avoid GMOs and artificial foods entirely. The items are healthy as well, designed to promote wellness. The boxes include 6 to 8 items each month. The main emphasis is snacks, but you’ll also find superfoods in the mix, along with wellness products and some supplements. There are 3 versions of the box to choose from: Original, Gluten-Free and Vegetarian. A month-to-month subscription costs $34.95 per month. You can save up to 15% by pre-paying for your subscription. There is also a SuperSnacker box. This premium box has more than 15 items, with an average value of more than $75. The box starts off at $59.95 per month, with the same discounts for pre-paying. One other thing to mention is that the snacks aren’t always different. You may receive multiple flavors of the same item or even duplicate flavors. This is particularly common in the SuperSnacker box. This diabetic-friendly box provides items that are low in sugar. The Sugar Smart Box makes an interesting weight loss choice, as all the items are low in sugar and in carbs. The choices are also suitable for the keto diet and for people with diabetes. Some of the included items are naturally low in sugar, like meat snacks and bags of nuts. Others may use natural sweeteners to provide you with some sweetness. With this box, you’re receiving at least 7 high-quality low sugar products each month. This includes some familiar brands and others that may be completely new. The subscription is relatively inexpensive, starting at $29.99 per month. Here’s a versatile box with multiple sizes and styles to choose from. Urthbox is a popular choice for health. 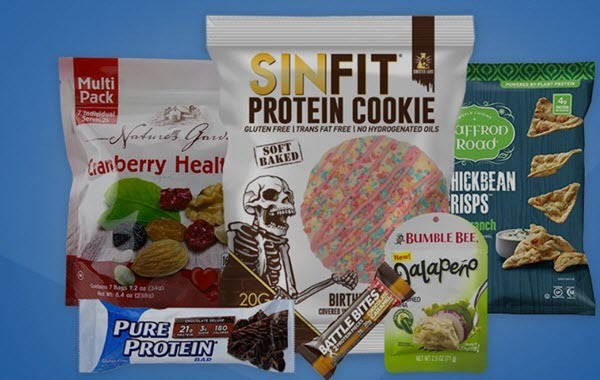 The company uses a strict set of guidelines to ensure that all items meet standards for calories, nutrition, manufacturing approaches and ingredients. These aspects are important for health and weight loss. There are also many ordering options. To begin with, you get to choose the size of your box. Mini (6+ snacks) costs $19.99 per month, Small (12+ snacks) costs $29.99 per month, Medium (18+ snacks) costs $39.99 per month and Large (25+ snacks) costs $49.99 per month. The next step is payment approaches. The prices in the previous paragraph are for paying month-to-month. Pre-paying for 3 months will save you $10 on your subscription, while you save $30 by pre-paying for 6 months. The final aspect is the type of subscription. 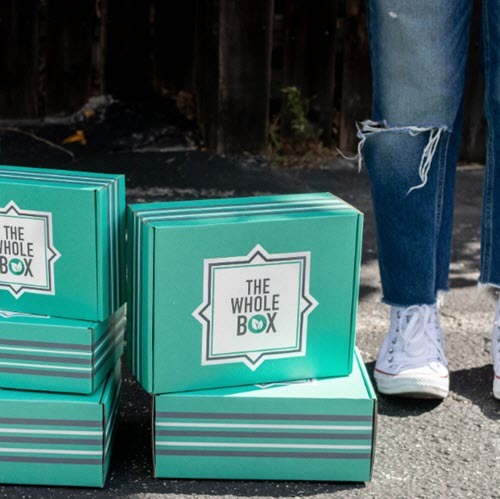 Urthbox offers Classic, Gluten Free, Vegan and Diet Boxes. The differences are clear based on the names. While all of the boxes would be suitable for weight loss, the Diet subscription is particularly relevant. It focuses on snacks that are low in fat, calories and/or carbs. While this box is designed for athletes, it is still highly relevant for weight loss. My Athlete Box is a subscription specifically designed for active females. The choice of snacks will also be ideal for weight loss, as athletic snacks are often high in protein, which helps you to stick to a diet. The company does have 3 different types of boxes (as is often the case), but the style is a little unusual. This time, the boxes are in tiers. The first tier is their Slim Package. It costs $19.99 per month on a month-to-month basis. The box contains motivational items, recipes, discount codes and, of course, snacks. The next tier up is their Core Box. It costs $39.99 per month. The base items are the same as the previous tier. The box also contains 1 or 2 pieces of apparel, some surprises and MAD workouts. Finally, there is the Badass Box, for $54.99 per month. It has the same items as the Core Box, along with monthly challenges, beauty products and various additional fitness items. All 3 tiers can be pre-purchased for 3 months. Doing so provides you with a discount on the monthly fee. 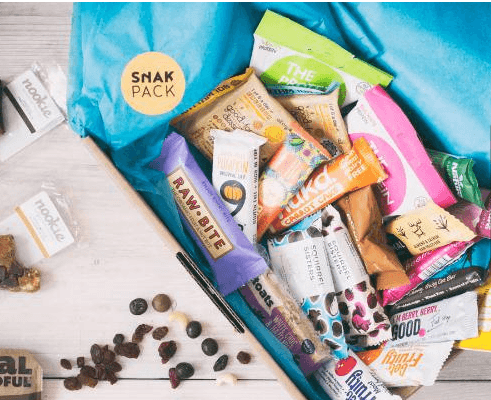 This UK-based snack box offers an amazing selection of healthy treats. Unlike most options on this list, Snak Pack is a UK-only subscription. Even so, the box is too good to ignore. The goal of the subscription is simple – healthy snacks that taste great. These are also gluten free, dairy free and vegan. Even more importantly, Snak Pack regularly looks for new products and flavors, so you’re not just getting the same types of snack time and time again. The smallest subscription option is called The Muncher. You pay £11.99 for the first month’s box and then £15.99 after that. You can save up to £28 by pre-paying for a longer period. There are no details about the number of items in the box, but an image on the site suggests that you’re looking at around 10 or so snacks. Alternatively, you can check out The Delux. This is a larger pack that contains around 15 snacks. It costs £20.99 for your initial month and then £29.99 after that. This time, pre-paying can save up to £60 (which is seriously impressive!). This protein-packed box is perfect for men who want to lose weight. BroteinBox is essentially a snack box packed with protein. Most, if not all, of the included snacks have significant protein in them. This includes protein bars and cookies, along with some less common examples, like protein chips and protein pancake mix. While the name and marketing imply that this is mostly targeted at men, the selection would be suitable for females too. As for the box itself, there are 10 to 13 snacks included every month. Subscription starts at $39.99 on a month-to-month basis, with some discounts for longer-term signups. There is also an Office BroBox. This is designed for a team environment and can feed 10 or more people. The full box contains 72 (or more) snacks and starts out at $199 per month. This fitness box focuses on muscle gaining, but it does have a weight loss aspect too. With a name like JackedPack, it’s not hard to see that this subscription box focuses on people who go to the gym regularly. The box is also unusual, as it doesn’t just provide a collection of snacks. Instead, the subscription mostly provides samples of various products. This includes items like testosterone boosters, protein powder, creatine and more. Another unusual aspect is the customizability. You’re able to provide various details, like your age, weight and gender, along with whether you’re aiming to build muscle and/or lose fat. The site asks about flavor preferences too. These details are then used to provide you with customized boxes of samples each month. If you want to pay from one month to the next, the subscription costs $15 per month. There are substantial discounts for pre-paying. A 6-month pre-paid membership averages to $12.50 per month, while a 12-month one is $11.25 per month. This box is designed for yoga lovers, focusing on snacks and related items. 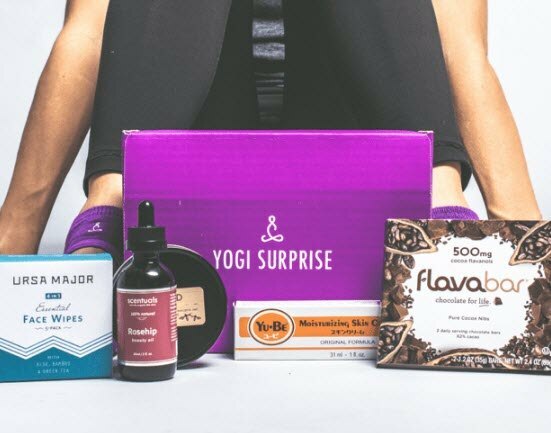 Yogi Surprise is more than just a snack box. The subscription provides you with a selection of items that are related to yoga and a yoga lifestyle, including products like vitamin C serum, face wipes and rosehip beauty oil. The main limitation is that there aren’t many snacks. Still, the items should all encourage you in a healthy lifestyle – a pattern that can help to promote weight loss. Subscribing to the box will cost you $44.95 per month, while the total box value is always more than $85. There are no options to pre-pay and you just cancel the subscription when you are done with it. This healthy snack company has a strong emphasis on protein. Snak Wize simply promotes itself as having various healthy snacks in each box. In practice, the company is focusing on high protein snacks, including various protein bars and cookies. This type of snack can be healthy and does support weight loss. In fact, many of the other companies follow a similar style. However, Snak Wize doesn’t have an especially unique selection. Many of their snacks are ones that you would find in a local store, like Clif bars and Pure Protein bars. The subscription starts at $39.99 per month (month-to-month). It can get as low as $22.99 per month if you’re prepared to pre-pay for your subscription. There are no details about the number of snacks per box, although the contents do look similar to what other companies offer. 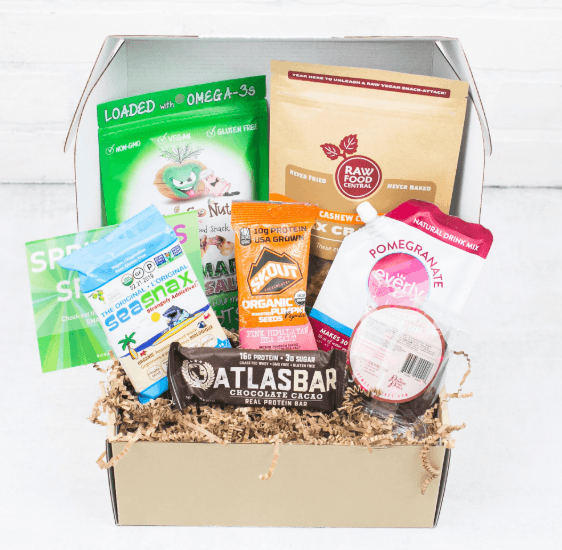 Here’s a Canadian subscription box that focuses on healthy snacks. 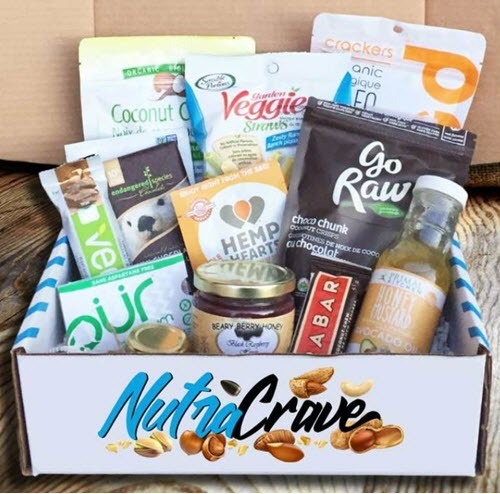 NutraCrave offers items that are vegan, gluten free and paleo-friendly. Some of these are snacks, while others might be supplements, beauty items or something else. There is also a mixture of sizes, with some full-size items and some samples. The first option is their Small Healthy Variety Box. This costs $38 on a month-to-month subscription. It contains 5 to 8 different items. There is also a Variety Healthy Snack Box. This version is $66.50 on subscription and contains between 7 to 12 products. Both versions are sent once every 2 months. You can also save 10% by pre-paying for your subscription. The company is Canadian and will ship out to Canada and the United States. Shipping appears to be free for Canadian addresses. It’s not clear whether the same is true for people in the United States. This is a simple way to get healthy snacks regularly. If you are just interested in snacks, Graze is an good choice. The company follows its own unusual style, offering 8 different tubs, each of which contains a different snack. These aren’t your typical pre-packaged snacks from a large company either. Graze has more than 100 types of snacks on hand and includes many flavor combinations. Some of them are fairly typical, while others aren’t. There is also the ability to customize. You’re able to provide information about the types of flavors and snacks that you want. This helps make sure that you end up with healthy snacks – ones that you also enjoy. Another key advantage is the price. Graze is inexpensive. You pay just $6.99 for your initial box. This gives you the chance to try it out. Later boxes will cost you $13.99 each. You get to choose how often you get the subscription too. Common options include twice weekly, weekly or every 2 weeks. The selection of snacks in this box is free from sugar, soy, dairy and gluten. The Whole Box doesn’t just focus on healthy snacks. The company also ensures that all ingredients are of high quality, while the snacks themselves are free from gluten, sugar, dairy and soy. The sugar free aspect is especially important – making these snacks better for you than most grocery store alternatives. This time, the box contains 5 to 7 snacks each month. That’s not all. You also receive coupons and discounts. These make it cheaper to buy healthy snacks yourself. You pay $30 per month on a month-to-month basis. Alternatively, you save $5 by pre-paying for 3 months or $60 by pre-paying for a year. This subscription is designed for runners and contains some fantastic snacks as well. Themed subscriptions, like Runner Crate, provide you with something a little bit different. You’re also getting more than just snacks. In this case, the boxes contain running gear, bling and running challenge items, along with snacks. There are 4 to 6 snacks each time, 1 or 2 of which are directly related to running. The type of snacks includes items like cookies, veggie chips, meat snacks, bars and more. The combination is also less expensive than buying the items individually. As for the subscription – there are 2 versions to choose from. 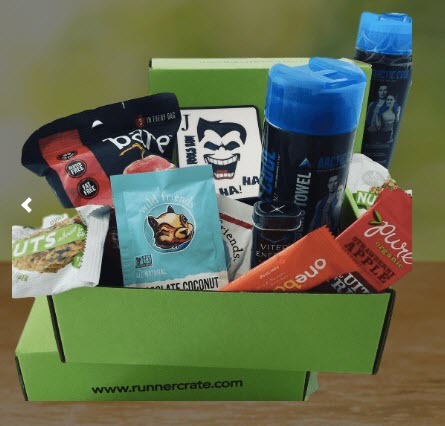 The Runner Crate costs $35 per month, while The Mini Runner Crate is $18.97 per month. The mini version has 4 to 5 snacks or pieces of gear. Both versions can only be purchased month-to-month. 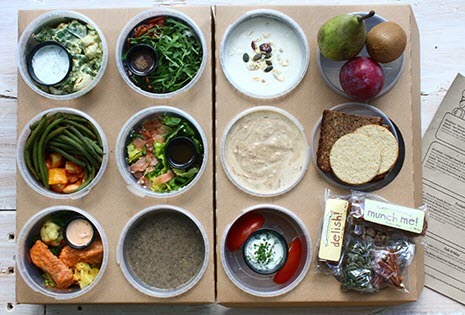 This unusual box offers meals for weight loss. Balance Box follows an unusual style. It looks more like a prepared meal service than a regular subscription box – as you receive 3 meals and 2 snacks per day within the box. The meals often include selections like homemade granola & yogurt, salads, or soup. Snacks may include healthy bars, fruit & seeds, or something similar. It’s easy to see how the box would promote weight loss. After all, you’re getting healthy meals and snacks prepared for you. This helps you avoid overeating. The company offers 4 menus: Classic, Vegetarian, Pescatarian and Free From. There are also 2 portion sizes. The Lighter Plan contains roughly 1,200 calories each day, with a daily cost of £22.99. The Market Plan is larger, containing around 1,8oo calories each day. This time, the daily cost is £27.99. This box is designed for people who have just had weight loss surgery. My Bariatric Box was developed for a narrow audience – people who have been through bariatric surgery. The idea is important, as surgery isn’t the end of a weight loss journey. Recipients also need to change their diet and lifestyle following surgery. A box like this is a good way to do so. The monthly box provides at least 7 bariatric-friendly items each month. These may be snacks or foods. Non-edible items are also included from time-to-time. As the marketing highlights, this style allows you to try out new products and decide which ones are worth purchasing regularly. The regular version of the box costs $39.95 per month, with discounts of up to $80 if you choose to pre-pay. There is also a My Big Bariatric Box. This version contains 14 or more items and costs $69.95 per month. This time, the pre-paying savings go up to $130. Here’s a company that emphasizes whole foods with healthy ingredients. The boxes from Love with Food don’t have a strong weight loss focus. Instead, the overall emphasis is on foods that are made with real ingredients and do not rely on additives, artificial flavoring or high fructose corn syrup. This type of food should still complement weight loss – as long as you pay attention to your calorie intake. There are 3 box sizes to consider. The Tasting Box is the smallest. It contains 7 or more snacks and costs between $7.99 and $9.99 per box. Then there is the Deluxe Box. It is priced between $16.50 and $19.95, offering 15 or more snacks. Finally, there is a Gluten Free Box. It contains 10 or more gluten free snacks, for a cost of $19.99 to $24.99 per box. Love with Food also donates at least 1 meal for each box that is purchased. These meals go to American families that do not have enough. The company has currently delivered more than a million meals. This is another reason to consider signing up yourself. This company provides ready-to-blend smoothies that are ideal for weight loss. Green Blender is a little like a meal kit company, as they provide portioned ingredients every week. The difference is that Green Blender simply focuses on smoothies and cereals, rather than full meals. Many people use smoothies when they are trying to lose weight, making this aspect of Green Blender especially relevant. The recipes (including the ingredients) all cost $4.99 per serving. You need to order between 5 and 11 recipes in each shipment. Many of the smoothies rely on superfoods too. These may provide additional health benefits. While Green Blender does have advantages, it isn’t a service that I’d recommend. When I tried it out myself, I found that many of their recipes weren’t as healthy as they appeared, while some of the smoothies tasted pretty unappealing too. If you want smoothies for weight loss, you might have better luck with a good protein powder brand and fresh ingredients. This isn’t just another keto subscription box, it also offers extra items that may help with weight loss. 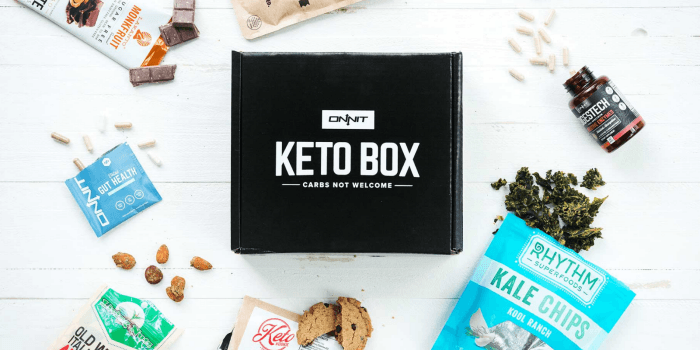 We’ve mentioned multiple keto boxes in this list already, but the Onnit Keto Box is a little different. It does still focus on keto snacks, but there are also various keto-friendly supplements included. These supplements can have additional benefits. For example, some may provide you with extra nutrients, while others may make it easier to reach ketosis. There is only 1 version of the box. This costs $55.95 as an individual purchase. You save 15% by ordering through a subscription instead. Unfortunately, some details aren’t provided. It isn’t clear how many snacks are in each box or how the company is defining keto. The price is also high compared to most other keto boxes. The subscription is best if you are very interested in trying out new supplements. If this isn’t the case, you may want to consider a keto snack subscription instead.